Being snowed in today calls for a pot of soup on the stove and a cake in the oven! I love having a pot of soup simmering on the stove all day. After several pots of Chicken Noodle Soup this winter, I think we're due for a nice, hearty beef soup. Wanting to use what I have in the freezer, I decided to try making a barley soup using ground beef instead of the beef cubes I usually use. 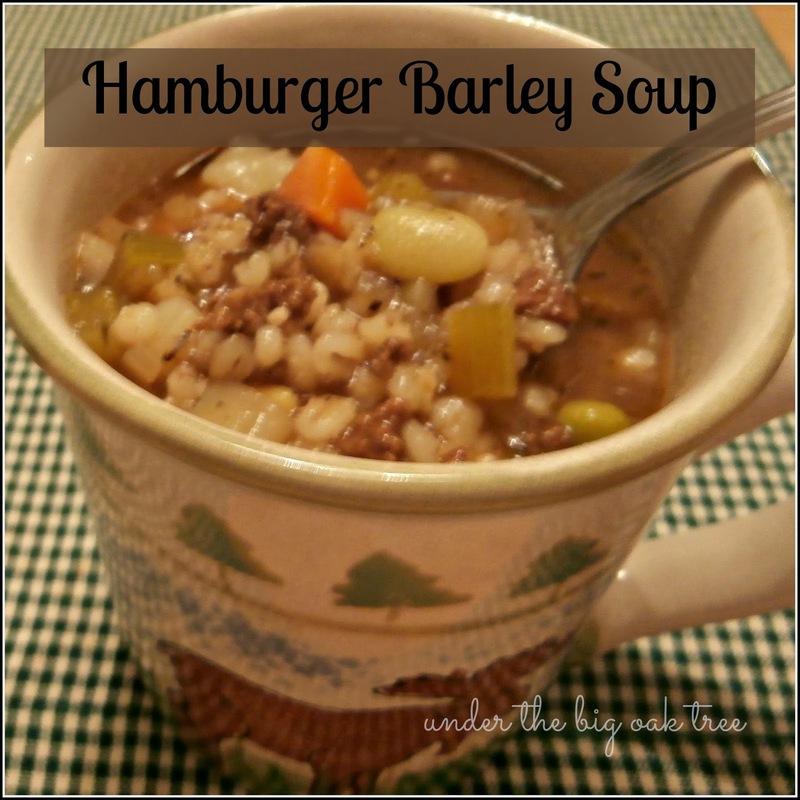 The result seemed to be a cross between Hamburger Soup and Beef Barley Soup. So good for this cold day. In a large pot or dutch oven, cook ground beef over medium heat until no longer pink. Drain grease. Add the fresh vegetables, stock, water seasonings and sauces. Bring to boil. Cover and reduce heat. Allow to simmer for about 1/2 hour or until the vegetables start to become tender. Stir in the frozen vegetables and the barley. Allow to cook for another 30 minutes - 40 minutes. I love how easy it is to throw this soup together but did consider how much quicker it would come together if I had used pre-cooked ground beef from the freezer. I used 3/4 lb. of ground beef to help keep the cost down on this soup, like I tend to do with a lot of recipes lately. But this soup is so full of veggies and barley, you could really just use 1/2 lb. without noticing.